Sometimes great wedding photographs are truly serendipitous in nature. You just happen to be in the right place at the right time and can capture magical pictures. This is a perfect example of what I’m talking about. This bride and groom, along with their wedding party, friends and family, endured somewhere around three inches of rain on their wedding day. The bride had to be covered with multiple large umbrellas to get her in and out of church for her wedding ceremony and we had to retreat to the comfort of their hotel to make pictures of the couple, the bridesmaids and the groomsmen. 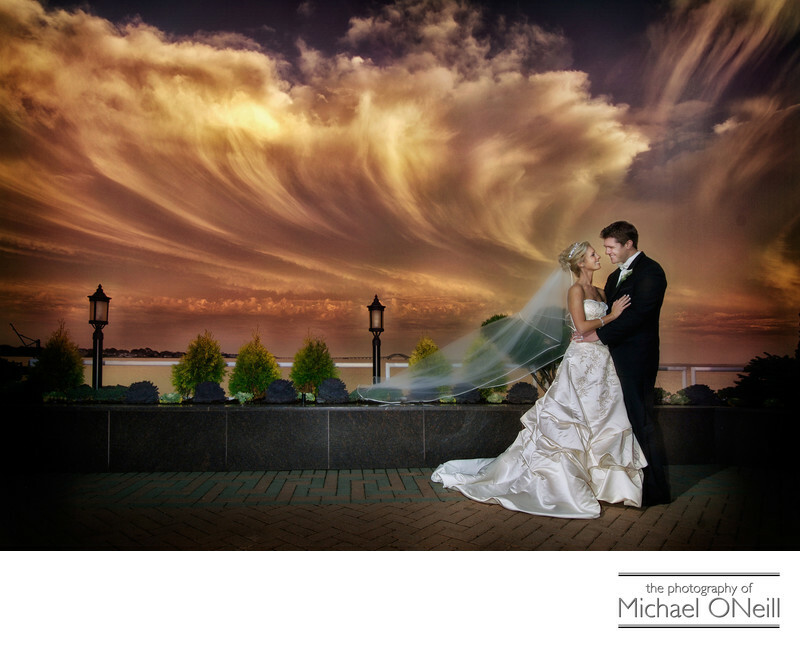 Their wedding reception was scheduled at The Venetian Yacht Club, the amazing waterfront catering establishment located right on The Great South Bay in Babylon, New York. It was hardly the kind of day that you have in mind when you’re planning an outdoor cocktail hour overlooking the water. Just as we arrived at The Venetian the sun broke through and the storm clouds started to rise into the evening sky. I rushed the bride and groom from their limousine, knowing that Mother Nature’s display was only going to last a few minutes before the sun set. Sure enough, five minutes later it was completely dark outside but we were all lucky enough to be in the right place at the right time to make the right photographs.